Pick-up for this Sale is Saturday April 6th, 12am to 6pm ONLY. Real wood arm post and front rail accent this traditional style. Features a multi pillow back and a 2 seat format. The body is covered in a plush chenille and is accented by a multi fabric high end, fresh correlate fabric package accented by fringe all around. Dimensions: 42W x 20D x 40H in. A glamorous design with a vintage vibe, this streamlined Chesterfield sofa anchors your living room layout in statement-making style. Founded atop conical legs in a warm brown finish, its wooden frame is padded with foam and upholstered with polyester velvet fabric to offer a medium seating firmness. Though its clean lines and solid hue may seem understated at first, tufted details complete the look with a tasteful touch of texture. Assembly is required. Aesthetically balanced table will add beauty to any room's decor. This carefully crafted piece is topped with a zebrawood finish on mocha on oak pedestal base. A center detail of the black on oak off sets the zebrawood top for a visual interest. It also provides a stunning view into chic and urban living. Immerse yourself into a new level of elegance and sophistication with this modern bathtub. A secure tub with thick walls made of high quality material ensures that you receive only the best in bathroom tubs. This bathtub is the answer to ultimate contemporary functionality and beauty at its best. 1) Tub is made of two acrylic sheets. The air between the sheets acts as a thermal insulator to help retain warmth. 2) Tub has adjustable legs for uneven floors. The inspiration for Maxwell "was to take a traditional shape and make it fresh," says Apartment Therapy founder Maxwell Ryan, who co-created the design with us. That means you'll enjoy a custom sofa that's "comfy, cozy, and approachable," with thick, contoured arms and piping details. At the same time, the sofa remains light and airy thanks to a thinner frame rail and turned leg. Designed in collaboration with The Everygirl, the Caitlin petite accent chair brings a touch of romance to any room. Its allure lies in details like piped seams, lumbar cushions, and tapered arms with soft pleating. These are matched with an otherwise clean profile, creating a piece that "fits as perfectly in a casual apartment as it does a formal living space," according to The Everygirl Founders Alaina and Danielle. A scaled-down version of our standard-size Caitlin chair, the Caitlin petite chair pairs easily with large sofas and sectionals, and fits well in smaller spaces. Its fully reversible cushion is made with soft, high-resilience foam wrapped in down, and its back cushions are constructed with a soft poly-down fill that allows you to fully sink in. Add beachy elegance to the casual home with this delightful Promenade Round Cocktail Table. Designed with a wonderful two tone finish of rich brown and antique linen, the round table is accented with a beveled glass insert and slatted lower shelf. A casual style with grace and interesting details, this cocktail table looks great in a coastal cottage setting. Post legs with V-shaped supports offers ample dimensionality and perfectly offset the linear quality of the lower shelf. Our most popular wicker nightstand available in wicker and a honey finish. This design is as classic as wicker gets and also has bun feet on the bottom of the nightstand. With its clean lines and bold design, this elegant extendable dining table is an architectural anchor for your stylish dining room ensemble. Striking a clean rectangular silhouette, this stunning design features a slab tabletop supported by a chunky rectangular pedestal base on a flat chrome panel platform. Designed for entertaining, this piece features a self-storing leaf to comfortably seat up to eight guests when fully extended. With its timeless silhouette, simple molding, and handsome woodgrain finish, this classic cabinet adds traditional appeal to any room in your home. Made from practical manufactured wood with laminate veneers, this charming design includes six spacious storage shelves behind four glass-panel doors. Perfectly placed in the living room, this design makes an excellent TV stand. 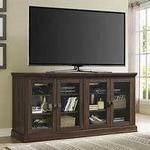 Set your flat screen atop this piece's generous sur the living room, this design makes an excellent TV stand. Set your flat screen atop this piece's generous surface and use the shelves to store your cable box, gaming console, DVD player, movies, books and more. The Mestler-Multi occasional table collection offers the look of reclaimed wood for a vintage casual design inspiration. The rustic style of the tables contrasts your other living room furniture to create a welcoming place for relaxing and entertaining. The color accented planks add a fun pop of color to complement the overall medium brown rustic finish over select veneer and hardwood solids. Go from cozy family meals to larger gatherings at a moment’s notice with this Extendable Dining Table, featuring a removable leaf that lets you seat up to six loved ones. Crafted from metal, its base features turned feet, curved sides for plenty of classic character. Up above, the round top is made from poplar solids and mindy veneers in a distressed neutral stain for a weathered touch. A centerpiece of any dining room, your tables are an important touch. The place where everyone gathers for a meal, it should have plenty of space for everyone while also delivering on-trend style. This table, for example, is a great option for seating many people in industrial style. Crafted from a concrete-looking top founded on sleek steel legs, this piece features a mixed-material minimalist silhouette for modern appeal. And as it measures 30'' H x 94.5'' L x 42'' W, it's generously sized to seat up to eight people. Perfect for a crafting space, organizing files and having a relaxing work space, this desk brings you storage and style. Drawers and shelving allow you to organize different size objects, whether its markers, stamps and other crafting items or just pens, envelopes and stamps that you always need on hand. Sitting on simple turned feet, linear drawer pulls and an antique white finish, this desk brings casual style with a hint of coastal or cottage. Use with a stool to create a completely relaxed work environment where you can enjoy getting things done. Finish & Paint Options	Antiqued white finish with glazing technique. Handles & Hardware	Linear bar pulls and rings. Case Detail	Paneled drawers and doors, turned feet and simple molding used throughout. Description: Top	Paneled wood table tops. Case Construction	Constructed from hand selected Birch veneers and Rubber wood solids. The ideal anchor for glamorous living rooms, this contemporary coffee table makes the perfect pick to fill out your ensemble. Crafted from a solid stone top with white, veined marble veneers, it sits atop a geometric metal base that features an open and distinctive design, adding character to your home. Measuring 14.5'' H x 36'' L x 36'' W, its tabletop has plenty of space for entertaining with drinks and appetizers, or staging coffee table books. Hand-forged iron base in gold foil finish with inset veneered white crystal fossilized stone top. The top will vary in color from piece to piece. Dimensions: 36W x 36D x 19H in. Equipped with Latest high quality Carbon Fiber Far Infrared Heaters. Situated at the back, side and calf areas to maximize heating area. Made out of 100% top quality Canadian Hemlock Wood. FSC Certified Wood - We care about our planet. Dual wall construction for better heat insulation. This also means that you could fit your sauna at tight spaces and not to worry about heat expansion and insulation. Unique "Tools-Free Design" - simply buckle the panels together and you are all good to go. 50% more cost - efficient than standard light bulbs. Take notice and engage your sensibilities with this plush dual cushion, organically shaped loveseat. Remark is gracefully positioned on solid natural wood dowel legs designed according to mid-century sentiments. Whether settling in with coffee and brunch, or entering a spirited discussion with friends, Remark’s polyester upholstery, two rows of finely stitched back seat buttons, and organic form ensure an eye-catching appeal at every turn. Bring depth and modernity to your contemporary living room or lounge area with the Remark mid-century modern style loveseat. This Low Post Headboard from the Proximity collection is crafted of figured cherry veneers and hardwood solids in a dark, lightly distressed Sumatra finish. If you enjoy refinement and wish to place your curio in a corner, this design is for you. Classic tracery patterns are incised into the front glass to give the curio a distinctive personality. This corner curio is solidly built in select hardwood solids and veneers with our deep Oxford Black finish. It features a mirrored back, high-low halogen lighting, four adjustable glass shelves, adjustable glides for leveling and a front-opening door. Incomplete Set appears to be missing the bench, molding and possible feet. The Sierra is a luxury 2-person infrared sauna made with Canadian red cedar wood that adds natural appeal and beauty to any decor. The Sierra 2-person sauna uses 7 advanced carbon nano heaters to provide an unmatched sauna experience. Carbon nano heaters offer the latest in infrared carbon heating technology to provide smooth evenly dispersed heat with no hot zones. The Sierra boasts the most spacious interior of all 2-person saunas on the market offering a full 6 inches more leg room than comparable models. Standard features include dual LED control panels, moveable ergonomic backrests for comfort and convenience, 7-color chromatherapy lighting, FM radio w/CD player and MP3, Oxgen Ionization system, interior reading lamp, exterior recessed lighting, and 10 mil tempered glass. Give your bedroom a fresh new look with the help of this beautiful bed. The perfect centerpiece for contemporary ensembles, this lovely design will instantly take your space from simply stylish to sophisticated. The clean-lined silhouette and gray upholstery gives this piece its modern foundation, while the nailhead trim elevates it with chic flair. Set this bed against an empty wall in your bedroom, then top it with silky white sheets, a crisp white duvet, and an arrangement of black and white patterned pillows for a cohesive and contemporary display. Finally, hang a colorful abstract painting on the wall above your new headboard to round out the look with bold, artful style.